A photo taken by a friend. I haven’t had a chance to see this piece in person yet, but apparently it’s on 100 East, between 100 and 200 South. When I plugged it into Google Translate, I was told “je m’en fiche” means “I do not care” in French. 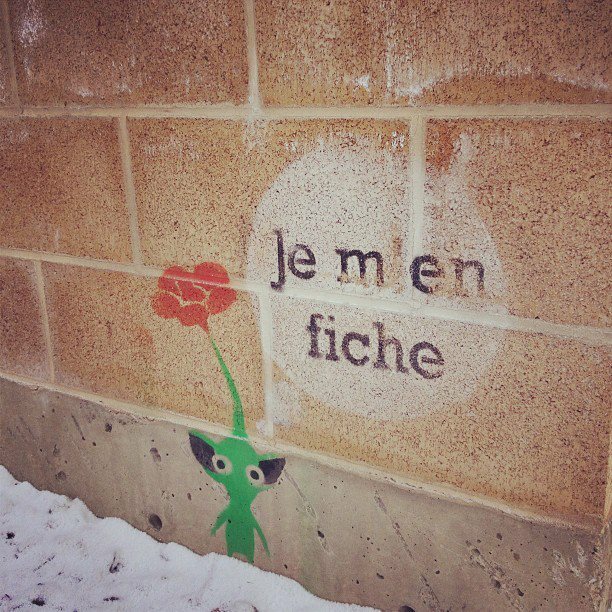 However, “je men fiche” apparently means “I plug men.” I think I see an apostrophe in there, but I suppose each viewer will have to decide which translation is truer to her/himself. I’ve written many times before about guerrilla art, most often in the case of Leuven, and I think it’s fair to say I’m a fan of it when it’s interesting, beautiful or intellectually stimulating in some way. I’d say this piece fits the bill and makes Provo just a little bit more delightful. [Police special operations coordinator Jana-Lee] Haigh believes the stencil idea was influenced by a 2010 documentary at the Sundance Film Festival on Banksy, a British graffiti artist whose art is typically a commentary on politics and society. “After they screened the movie, stenciled graffiti went up in Park City,” Haigh said. No matter what the graffiti says or looks like, Provo’s policy is to paint over or power wash graffiti within 48 hours, according Haigh. I suspect most street artists knew about Banksy before the Sundance movie about him, but there’s no doubt that the Provo piece was inspired by that world famous artist. Daily Herald photographer James Roh took a picture of the piece, which can be viewed along with the article. Part of a piece by Leuven that went up in June. I’ve written repeatedly about street art on this blog, most often about the work of wheat-paste extraordinaire Leuven. My feeling has always been that while questionably legal street art can enrich a community and elicit thought-provoking experiences from otherwise boring places. Street art has long had a strained relationship with the public, with illegal graffiti and tags considered symbols of urban decay. But that relationship has become more complicated as a new generation of street artists teams up with officials and businesses on legally sanctioned projects to revitalize public space. That article packs a lot of information, much of it about Atlanta, but the idea that emerges is that street art is increasingly recognized as a potential positive force in certain situations. In Provo, moreover, a young and fast-growing population means there will not likely be a decrease in the number of artists willing to go out and use other people’s blank walls for canvases. Police can fight that trend, but it might also be worth officially embracing it with just the sort of authorized area that someone recently invented. The entire piece includes images of two people looking at each other. I think the same could be said about Provo and there are few people who epitomize that idea better than musician Chance Lewis. Chance, Apt, and a whole bunch of other Provo musicians at a Rooftop Concert this summer. This Wednesday, Chance will be releasing his latest effort “We’re Just Happy To Be Here.” The show has already garnered a bunch of press; last week it was featured in City Weekly, on C. Jane’s blog, and in the Daily Herald. Between those links you can find all the relevant information, and even hear several tracks. I recommend going to this show because if past experience is any indication, it’ll be awesome. But if you’re still sitting on the fence remember the quote about Rome. 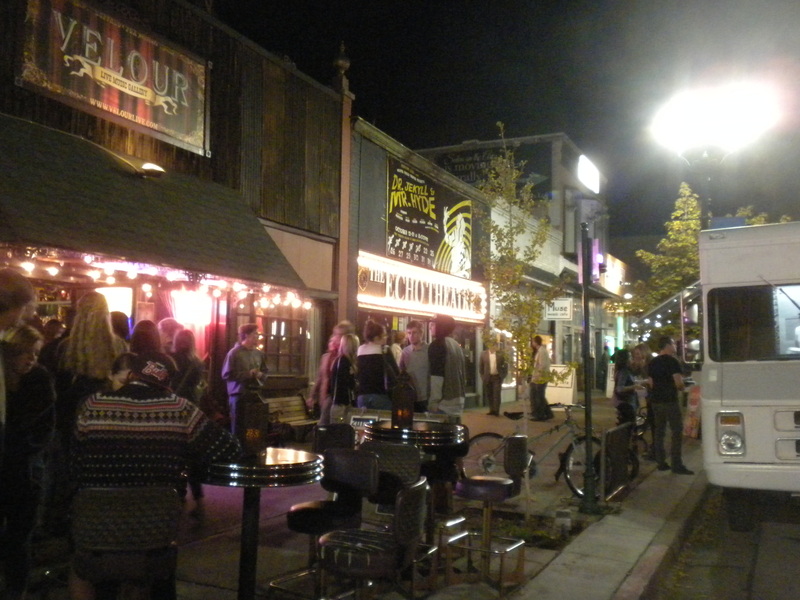 On this blog I constantly write about ways to make Provo cooler, more accommodating to future generations, and generally more vibrant. The possible strategies are endless and too often, I think, the focus is on big building projects or massive design ideas. But Chance and Apt are showing how a city really becomes great: they’re living here and making really great music. So someday, when someone loves Provo because it’s great, it’ll be in part because at one point these musicians opted to live here and make it amazing. On Thanksgiving day I went on a walk downtown with several family members. When we passed the vacant lot I mentioned in this post, we discovered that it had become the home of several large wooden spools. Then, a few days after I wrote this post about a similar lot in Salt Lake City, my friend Josh Yost sent me a couple of great pictures of the spools. Spools in a vacant lot on Center Street. Another view of the spools. When my family and I happened on these spools, we weren’t sure what to make of them. Were they just discarded trash? Were they a guerrilla art installation? Could we mess with them without getting in trouble? Apparently we could, because we did. Laura even tried to walk on one while it was rolling, sort of like a cartoon character. More importantly, these simple additions show how easy it is to draw people into a space and make it interactive. I’m not sure if this was intended as art. And either way it’s less visually arresting than the piece in the Salt Lake lot. But it’s also more interactive. While the Salt Lake example invites users to walk through it and maybe touch it, this is all about moving things around. It’s like a giant set of wooden blocks for adults (and kids). And ultimately, it took a relatively ugly spot and made it a place for human interaction and exploration, which is really the goal of any public space. That’s not to say this is suddenly a beautiful spot. It’s not. And adding discarded spools is not generally going to solve the world’s placemaking challenges. But despite these shortcomings this site shows how little additions to a space can make a big difference. 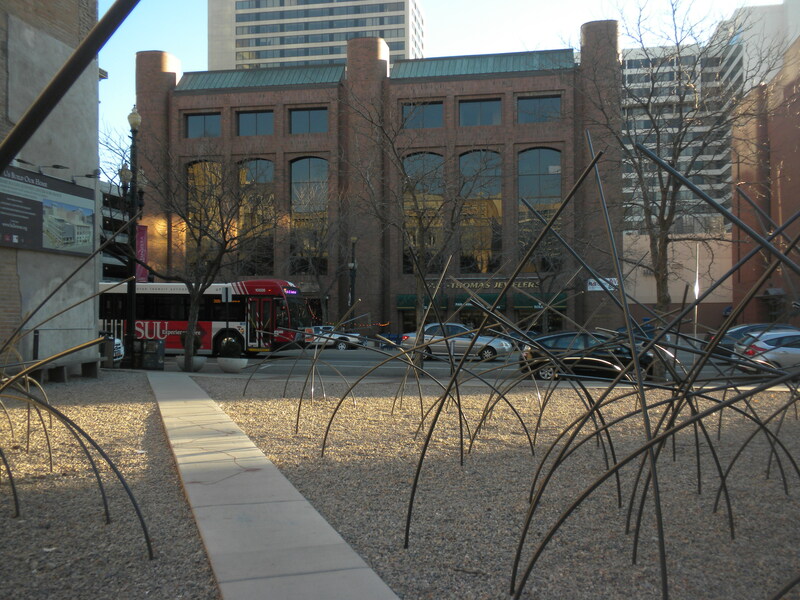 While wandering around Salt Lake City last week, I saw the art installation in the pictures below. It’s made up of rows of black PVC pipe and is interactive; visitors can walk through the pipes, touch them, and pretty much do anything they want. A PVC art installation in an undeveloped Salt Lake City lot. 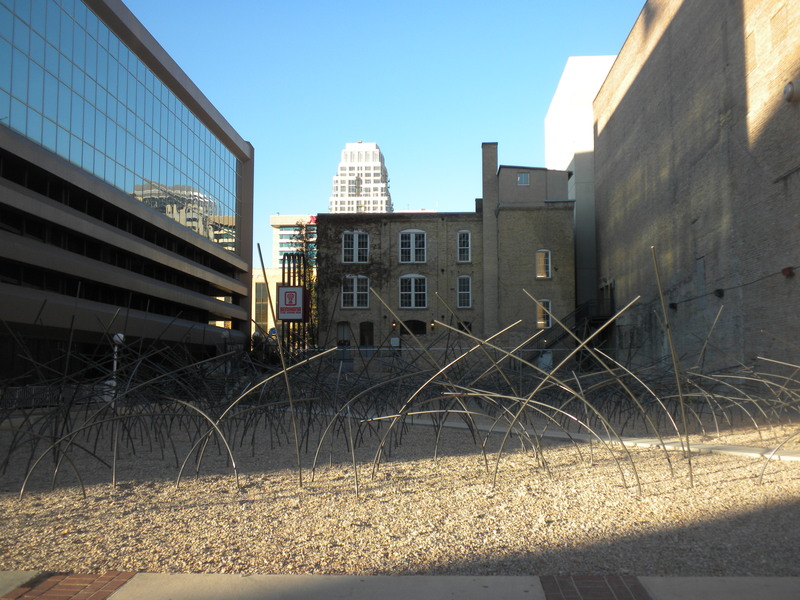 The same installation, looking in a different direction. Provo has similar vacant lots, which I’ve written about previously. I suggested installing a zen garden in downtown Provo, but this example from Salt Lake shows how a little creativity (and an artist) can create an interesting space that calls out for attention, rather than repelling visitors. And truthfully, I like this idea better than the one I proposed for Provo. 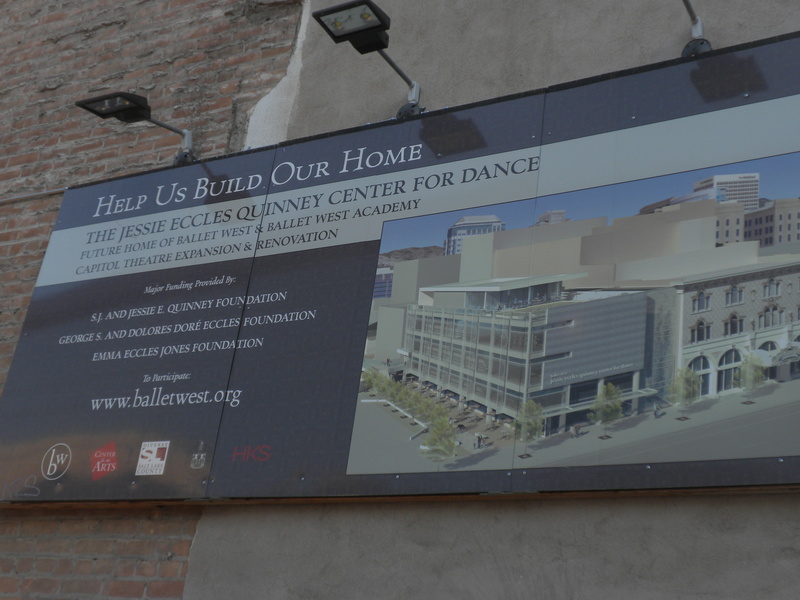 It’s also worth mentioning that the lot is slated for development as a dance academy. Still, someone invested in the installation and created a memorable place in the city. Someday this installation will be replaced with the building on the left of this rendering. In a piece about music, Richard Florida reported today on the per capita popularity of various music scenes. Though the article doesn’t link to the source data and doesn’t mention Provo specifically, the city does show up as a dot on various maps. That in itself is an accomplishment; there are other cities that don’t show up at all or that show up as smaller dots. 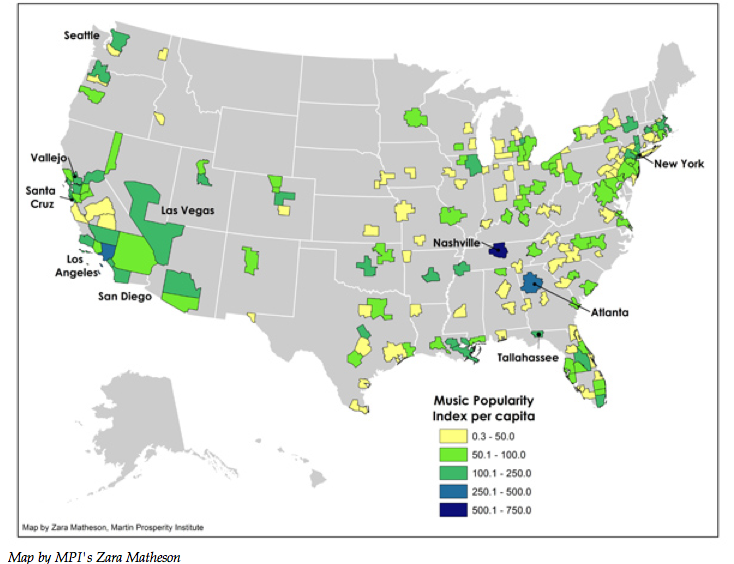 This map shows a “Music Popularity Index per capita,” which basically means the popularity of a music scene as represented through Myspace balanced by the population of that scene’s metro area. 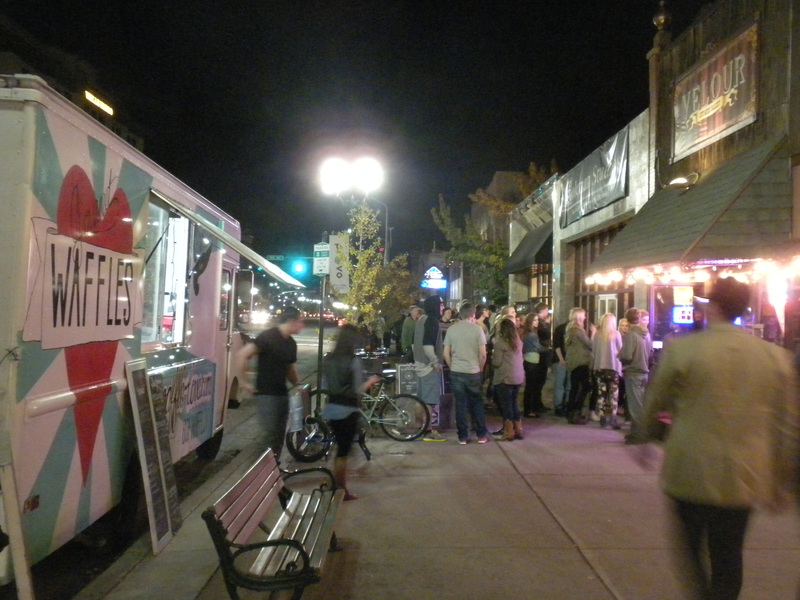 Concert goers wait outside Velour for a show. Though the Provo metro area isn’t a top 20 city — which are all mentioned by name — it is shaded in dark green. That puts it in the same in general category is Las Vegas, Portland, Seattle, Denver and big parts of both coasts. It beats a whole lot of other cities. Keep in mind also that this data was collected in 2007 via Myspace. That predates a massive amount of growth in Provo’s music scene that includes several bands — Neon Trees, Fictionist — getting record deals, the explosion of the Rooftop Concert Series and a number of older professional acts coming to the Covey Center. If this data were collected today, Provo would probably do even better. 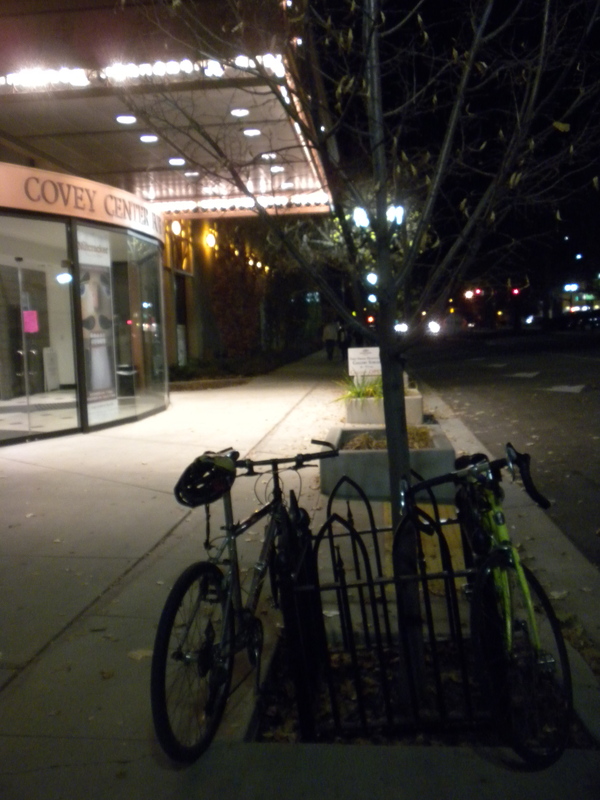 The Covey Center often hosts larger touring acts. But in any case, Provo is literally on the map. It actually does have a nationally competative music scene. And that means a more attractive city that will entice more people to call it home.